Holy Mass celebrated at the holiest site in the world - inside the Holy Sepulchre in Jerusalem on the exact spot where Christ rose from the dead. The small chapel can only fit a few inside. Thanks, Fr. Pablo! In the form of a cross. Exquisite antique vestments. I got to inspect one today - the highest quality and a great gift idea. In my humble opinion, most often superior beauty and quality. 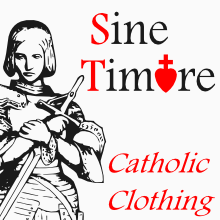 Yours truly grew up in a parish of antique vestments. Vestments which had been thrown out or given away by other parishes. 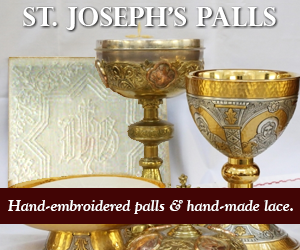 That parish has to this day the best vestment collection in the diocese, St. Agnes church in St. Paul, Minn. You find foreign missions commonly have some of the best vestments as well - treasures given away by parishes to the diocesan Propaganda Fide offices. The false half-sleeve seen on a zimarra. 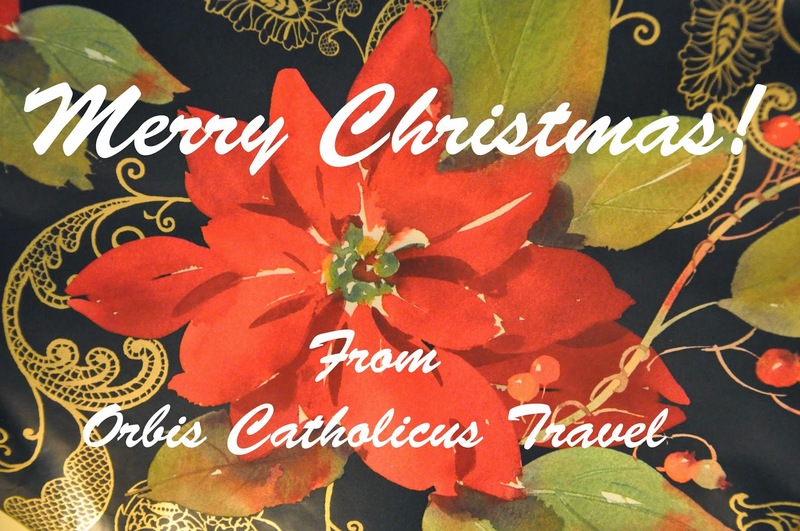 From the Archiepiscopus Sancti Pauli in Minnesota. "In the 5199th year of the creation of the world, from the time when God in the beginning created the heaven and earth; the 2957th year after the flood; the 2015th year from the birth of Abraham; the 1510th year from Moses; and the going forth of the people of Israel from Egypt; the 1032nd year from the anointing of David King: in the 65th week according to the prophecy of Daniel; in the 194th Olympiad; the 752nd year from the foundation of the City of Rome; the 42nd year of the rule of Octavian Augustus, all the earth being at peace, Jesus Christ, the Eternal God, and the Son of the Eternal Father, desirous to sanctify the world by his most merciful coming, being conceived by the Holy Spirit, nine months after his conception was born in Bethlehem of Juda, made Man of the Virgin Mary. The Nativity of our Lord Jesus Christ according to the Flesh." "And since, though the habit does not make the monk, it is necessary nevertheless that clerics always wear a dress comfortable to their order, that by the propriety of their outward apparel they may show forth the inward uprightness of their morals, yet to such a degree have the contempt of religion and the boldness of some grown in these days, that esteeming but little their own dignity and the clerical honor, they even wear in public the dress of laymen, setting their feet in different paths, one of things divine, the other of the flesh." Collection of Modern Religious Art, Vatican Museums. 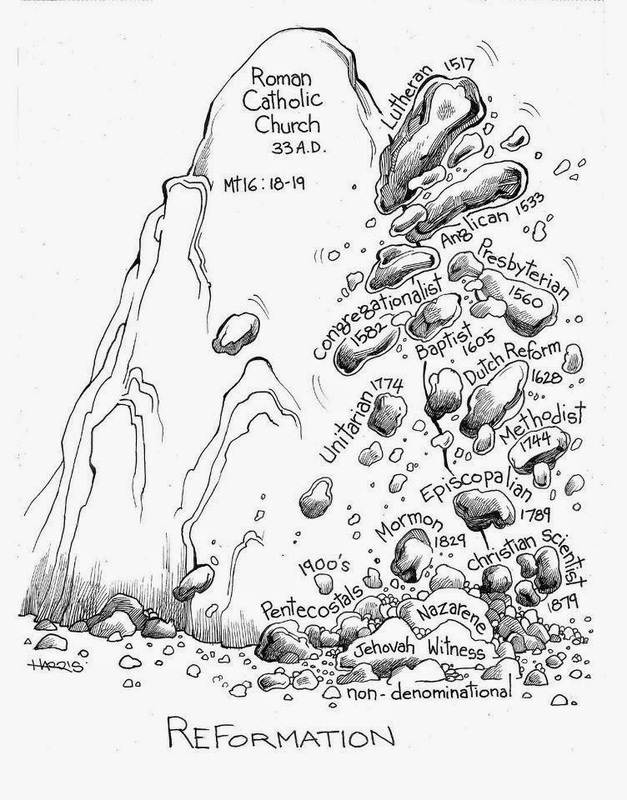 Pray for the return of all those whom the Holy See recognizes as being in schism from Her Body, the One Apostolic Church. A fabulous reproduction oil on canvas of Prophet Isaiah within the Sistine Chapel ceiling located at St. Agnes church in St. Paul, Minnesota. St. Louis, King of France, Pray for Us! Church of St. Louis located in St. Paul, Minnesota (USA). We need to encourage devotion to the Holy Family of Nazareth more today than ever. A nice newly carved wooden statue seen in St. Louis Park, Minnesota. 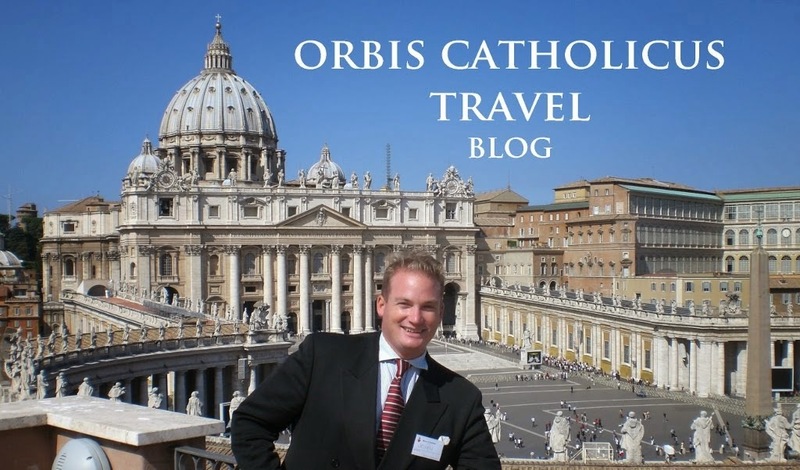 When you visit the maritime resort of Amalfi, located on the Amalfi Coast, you will see this cross everywhere. The local inhabitants are proud to explain the origins of this "Maltese" cross and boast frequently, "It came from us first!" Derham Hall was established by the Sisters of St. Joseph in 1905 as a college preparatory school for girls and was originally located here in this building on the campus of the College of St. Catherine in St. Paul, Minnesota. They make great indoor or outdoor decorations. Fine gifts and great souvenirs. Yours truly heard this song played once in church, in 1993. Was lovely. I was off to World Youth Day in Denver to see the Pope and my grandfather said he would play it for me on the organ and my dad sang the lyrics from the choir loft after Communion. I had never heard of this song. The experience was very impressionable. Beautiful to highlight a neighborhood landmark at night. Holy Family in St. Louis Park, USA. The feast of Christmas was celebrated from the very first ages in the Western Church, and it was fixed for December 25 at the end of the third century. But for a long time the Eastern Church celebrated this feast and the Epiphany conjointly on January 6, under the name, common to both mysteries, of Theophany. It was only at the end of the fourth century that the Greeks made the Nativity a special feast and began to celebrate it on the same day as the Latins. It was from this time also that the Western Church began to observe the feast of the Epiphany. You have maybe never heard of them. 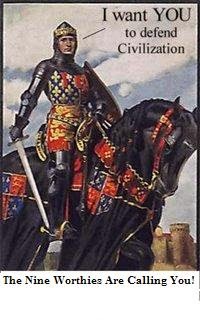 They date back to the Middle Ages and personify the ideals of chivalry. The Nine Valiants. So important to give our kids role models. The virtues they manifest are timeless and universal. All Catholic males ought to seek to display an outstanding quality of chivalry and to be exemplars of true Christian manhood. Wine is blessed on the Feast of St. John in remembrance of the legend that St. John safely drank poisoned wine offered to him by his enemy after blessing it. In Rome we carried our bottles of wine to church in a basket on this day for the blessing after Holy Mass. Lord, Jesus Christ, Son of the living God, who in Cana of Galilee changed water into wine, be pleased to bless + and to hallow + this creature, wine, which you have given as refreshment for your servants. And grant that whenever it is taken as drink or poured into wounds it will be accompanied by an outpouring of grace from on high. A Child's Prayer Before the Throne: "Dear Jesus, I luv U. Merry Christmas!" "He hath made heaven and earth of nought" is your one thought as you touch the star. One of the greatest honors of my life - to be here for Christmas Midnight Mass with the Latin Patriarch of Jerusalem. In the original cave-grotto. It's still here today. And waiting for your visit. Beatum tibi sit nativitatis Domini festum, annus autem novus faustus felixque! One of our most historic Catholic churches is now a mosque and Islamic center. The Church of St. John was a home to Catholics in St. Paul, Minnesota since 1886. The present church structure, school and rectory were constructed in the 1920s. It was jolting to drive by and to see the cross had been knocked down from the front facade. It really does hit home. I last attended Holy Mass here in 2009. The church looked full on that day. In 2013 the church was closed and it was sold to the religion of Islam June 20 of this year. I had relatives who were parishioners here. What next is what many are asking. Many are fearful the Archdiocese will do the same thing in Minneapolis with St. Boniface. This had been main street in St. Paul, Minnesota. 7th Street. Full of life. The main thoroughfare through downtown. Here was the St. Francis Hotel. The cute shops. The heart of the city. Then came the liberal Democrats in the 1970s with DFL Mayor George Latimer. They had the bright idea to shut the street down. That would create new life, they said. They called it redevelopment. Cars were forbidden to drive here. Buildings were constructed in the center of the street. The small businesses had to relocate to Grand Avenue. The whole experiment proved a titanic failure. Skyways were a flop and so was the laughable complex in the center of the photo, which they ignorantly had named The World Trade Center. The St. Paul Companies complex remains. Some affordable housing and empty office space remains. But nobody else. Business is dead and the city has lacked the magic twinkle of downtown since. Thanks, guys. It has been a painful death. Yours truly once knew a student from Belgium in Rome. She would show up at every party with a big bottle of Belgian Abbey beer. It was the highlight of the party. When you visit Lourdes you will have to taste this fine wine. Yours truly purchased this bottle there ten years go. Now just waiting for a special occasion. When you visit a place like Bruge, Beligium, you will see lots of lovely tapestries for sale everywhere. Bruge is the capital and largest city in the province of West Flanders in the Flemish region of Beligum. Craye is a local firm that specializes in the reproduction of wall tapestries. They make colorful and lasting souvenirs. Jacob Schmidt Brewing Company of Saint Paul, Minnesota. It will always be the best. My favorite place for pizza in the United States. Located in St. Paul, Minnesota. A little piece of the old Italian levee and Holy Redeemer parish (the downtown Italian parish that once stood on the campus of present day St. Joseph’s Hospital). Mons. Louis Pioletti, pray for us! Arms of a fine Catholic layman, I.A. O’Shaughnessy. Seen inside the old library at the College of St. Thomas, constructed in the 1950s. From his home on 1705 Summit Avenue he gave countless millions to the Church. Knight of the Equestrian Order of the Holy Sepulchre of Jerusalem. Knight of the Order Malta. Chamberlain of Sword and Cape. Visit St. Thomas Academy or the University of St. Thomas and you will see the names of rich people everywhere - donor recognition - people who give and so receive their reward. It seems it has gotten a bit out of hand. You see the names everywhere on every new structure on campus. And both STA and UST are more frequently than ever naming buildings after people still living (which is against our tradition). Everyone knows that Jesus says alms are to be given in secret (cf. Matthew 6:4). And Jesus also says not to give as the hypocrites (cf. Matthew 6:2). Buildings are not to be named after persons still living. This can cause great harm and scandal - especially when these persons are in public defiance of Church teaching on matters of faith and morals. Lawyer Mike Ciresi comes to mind. Living persons can still die as apostates or heretics or schismatics. Earlier this year, St. Agnes tore down Bandas Hall and they are rebuilding a new structure in its place. I hope they will retain the same name. I had classes in that building for four years. Rt. Rev. Msgr. Rudolph G. Bandas, S.T.D. et M., Ph.D.Agg. had been arguably the most educated priest of the history of the Archdiocese. He had been rector of the St. Paul Seminary, pastor of St. Agnes church, peritus at Vatican Council II, a domestic prelate with title of Right Reverend Monsignor, author of countless books on the subject of Catholic education - books which were translated into many languages. I once saw one of his books for sale in Rome, Italy. He was born April 18, 1896, ordained June 19, 1921, and passed away June 26, 1969. O God, grant that Your servant Rudolph, whom You raised to priestly dignity in the priesthood of the apostles, may be admitted into their company forever. Through Christ our Lord. Amen. Sad news from Rome: http://www.thelocal.it/20141219/calligraphers-cry-foul-as-vatican-shuts-down-scrollmakers. 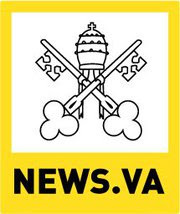 The Vatican prints are not the best prices, not the best quality, not the best selection, and limited to only select European languages. A Novena of Masses before Christmas with dinner served afterwards. Festive food after each Mass for nine days: http://en.wikipedia.org/wiki/Simbang_Gabi. The wonderful Filipino culture has a special direct link between worship and food. They always have lots of food for everyone and this celebration is no exception. A very enjoyable experience and it can be recommended for many more parishes. Join Us to See the Shroud of Turin!